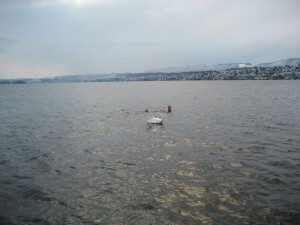 England in the World Championship, and a 5 hour swim in Lake Zurich on Monday (= 31 km weekend). I had hoped for cold water in Zurich, and even in Titisee, since Friday the water temp was still around 15°C, but by Sunday/Monday water temperatures had gone up to 21-22°C or even more. The Sahara summer over Europe had started. Titisee is a small very pitturesque lake in the Black Forest, with extremely dark water due to the tannin from the pine trees. We rented a pedal boat so Indu could accompany me (she took a dip in the end). The further we went to the other shore, the warmer the water became. When I stuck my head out of the water at the opposite shore, I saw a few campers and asked about the soccer score. When we started out, it had been 2:1 (the second goal for England was not counted), and now – 4:1 for Germany – incredible, after their performance against Serbia! If they can do that, maybe the Channel will also work this time! After a nice evening meal overlooking the lake at Alemannenhof we continued to Zurich, where I did my 5 hours on Monday from the lido to Saffa Island and back, just by myself, with a few short breaks in between. It was a very nice familiar feeling to be back at the Zurich lake after such a long time, and enjoy the vastness of the lake and the view to the mountains. It is pretty safe to swim up and down for 1500m along the southern shoreline, where you can even see the sandy ground or the water plants in the clear water. In the evening I had my first major sunburn – but was very happy. 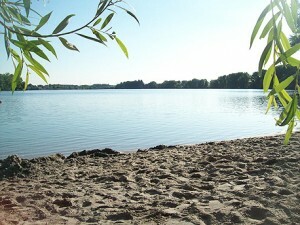 Looking forward to the big Zurich Lake swim on Aug. 8th. Which will be the next big training step for Dover. From then on my cold water training was restricted to the little “Kneipp” basin with 11°C water next to the outdoor pool in Bammental. 3+7 hour lake swims July 17/18 (=30 km), 1+6 hours July 24/25th, both in Roxheim – heavily distracted by following Chloe`s successful double and Jackie Cobell`s incredible 28 hour solo via the AIS trackers. I had hoped to do more long swims in bigger and colder lakes – but with water temps too warm everywhere there is no reason to spend lots of time and money travelling – except to Dover. Since my running and biking is quite reduced due to time restrictions, and finances are a factor, too, I am thinking of shortening the triathlon distance a little for this year, back to the original idea – and leave room for more later. Dover training: booked a Euroline bus ticket to Dover for next weekend Fr to Monday to start serious cold water training. Really looking forward to it, and then Zurich lake the weekend after!